With all the information that’s out there in regards to health, wellbeing, nutrition and exercise, it’s easy to get lost in the information. We’ll try to keep this article simple and to the point. 1 Lesson to Improve Your Quality of Life: There is no process that does not require time. 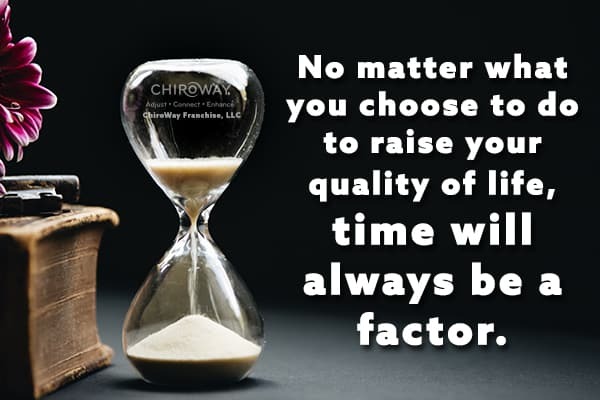 No matter what you choose to do to raise your quality of life, time will always be a factor. It takes about 38 weeks for a baby to fully develop all its organs and body systems before its ready to be born. It takes about 7 days for a minor cut to be healed. It takes about 21 days to form a new habit. Time is always a factor and if you want to see results from what you’re putting your time and energy into, try to focus on the current action that you’re taking rather than the results. Focusing on the results may shift your focus to how long it’s taking to get what you want, rather than being proud of the steps you’re taking to get there. The results you’re looking for will come with time, but it may take longer than you expected which can cause frustration and fatigue if that’s where you decide to keep your focus. Consistency is key. Consistent action will help you achieve your goals and get to where you want to be over time. By focusing on the work, effort and consistent action that you’re taking, it gives you confidence that change will happen in due time. Time is always going to be a part of the process, so remember to enjoy the process to reach your desired quality of life. Use this principle of time to your advantage: invest into your children’s quality of life now so they can get a head start on the time and effort it takes to enhance their wellbeing. The information in our articles are not intended to diagnose, mitigate or prescribe the use of any technique as a form of treatment for any physical conditions, symptoms or diseases. Directly consult with a qualified health care professional for any chiropractic or medical advice. In addition to the benefits of chiropractic care, one should also be aware of the existence of some risks. Risks associated with some chiropractic care may include soreness, musculoskeletal sprain/strain, and fracture. In addition, there have been reported cases of stroke associated with chiropractic care. Research and scientific evidence does not establish a cause and effect relationship between chiropractic care and the occurrence of stroke; rather studies indicate that people may be consulting chiropractors when they are in the early states of a stroke. In essence, there is a stroke already in process. However, you are being informed of this reported risk. Copyright © 2019 ChiroWay Franchise.